WASHINGTON (April 20, 2012) -- An Army Reserve officer who researched the effectiveness of energy-saving "micro-grid" technology in Afghanistan was among nine Americans honored as "Champions of Change" by the White House, April 19. As a civilian, Alan Samuels works as a research chemist at Edgewood Chemical Biological Center at Aberdeen Proving Ground, Md., where he studies remote-sensing technology for the Army. As a lieutenant colonel in the Army Reserve, he recently returned from deployment to Afghanistan, where he supported the efforts of the Army's Research, Development, and Engineering Command to evaluate better ways to more efficiently use energy in a combat environment. 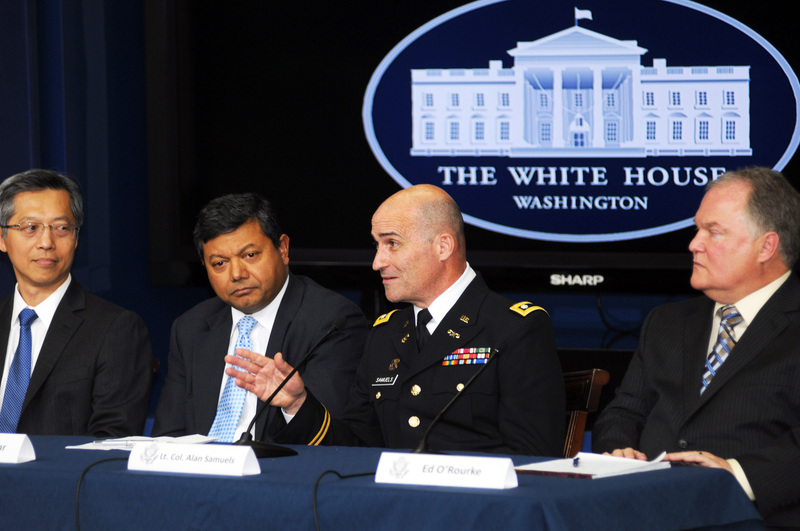 Lt. Col. Alan Samuels, who researched the effectiveness of energy-saving "micro-grid" technology in Afghanistan, was among nine Americans honored as "Champions of Change" by the White House, April 19, 2012. "It's a very humbling thing for me as a research chemist without any real expertise in power and energy," Samuels said of being honored as a Champion of Change. "I am glad I was able to make a contribution to help out." Samuels deployed to Afghanistan in April 2011 to stand up a science and technology integration and collaboration center at Bagram Airfield. He and his team collaborated and shared information with other Army and Department of Defense agencies in theater to address operational energy challenges there. One of the efforts Samuels was involved in was to assess, in an operational environment, the efficiency of traditional power-distribution systems using generators, and how that changes with the addition of "micro-grid" technology. Traditional power-distribution networks on a forward operating base, or FOB, in a combat environment, Samuels said, are using fuel inefficiently. "We had 60kw generators putting out anywhere from 5-15kw around the FOB," he explained. "That is kind of bad news for the generator systems. They are using a lot of fuel they don't have to. Second, there are maintenance issues. Since the generator is not running at its load, then it's not reaching the temperature it needs to efficiently burn that fuel and put out the power, based on the demand." Micro-grid technology, Samuel said, makes the whole system more efficient and so they use less fuel. "So what these computer technologies do as components of the micro-grid systems is sense that load and only turn on those generators that are needed," he said. "And their maintenance, as well as their fuel consumption, goes way down." Samuels said in Afghanistan, in an operational environment, he was able to observe a 17-percent reduction in the amount of fuel used, relative to the baseline, just using micro-grid technology. Samuels said assessments for how fuel usage numbers change, how efficiency changes with demand-side reductions in energy use, are still underway. The "demand side" of the energy equation is the user, and how much electricity he pulls from the grid. Ways to reduce efficiency on the user side can involve things like improving the efficiency of environmental control units that cool and heat tents, placing shades over the tops of tents to reduce solar loads, and using thermal quilts to insulate tents, "so you are not trying to cool the tent when you really only have the thickness of canvas as insulation," Samuels said. Those kinds of improvements to demand-side efficiency could also significantly reduce the amount of fuel used on a FOB or a combat outpost, or COP, Samuels said. But those assessments are still underway, because they will be conducted through multiple seasons in theater to get the best numbers. Reducing the amount of fuel used in theater is not just an environmental concern, or even a cost concern, it's a concern for the lives of Soldiers. "The Army's mission is very dependent on power and energy, and upon our ability to adapt, change and innovate to the circumstances in which our forces find ourselves," said Katherine Hammack, the assistant secretary of the Army for Installations, Environment and Technology. Technology, like micro-grids, can reduce fuel usage, and the great costs associated with providing it. "It means that we can have fewer fuel convoys on the road," Hammack said. "One in every 46 convoys suffers a casualty, which means if we have fewer convoys over the road, we are saving lives."